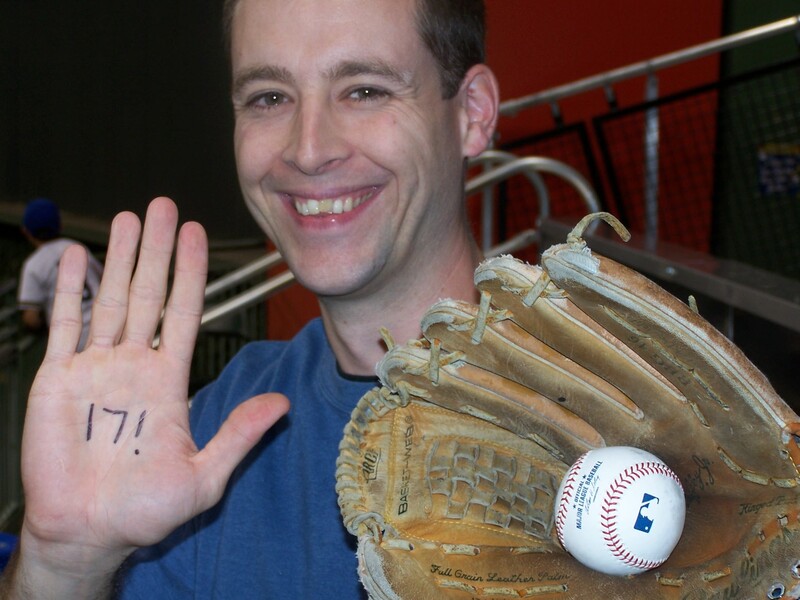 According to the “Master of Snag” (aka Zack Hample), he states he once snagged 17 baseballs in his very first trip to Miller Park. Seventeen! The date was June 11, 2003 (you can see for yourself on his website by clicking here). retired) and 17 seemed to be the all-time Milwaukee single-game record. Zack and I have joked that there was no way I could allow a New Yorker to hold the single game record here in Milwaukee. I came close on 4/27/09 (and set a personal high in the process) but no cigar. Would I ever do it?? 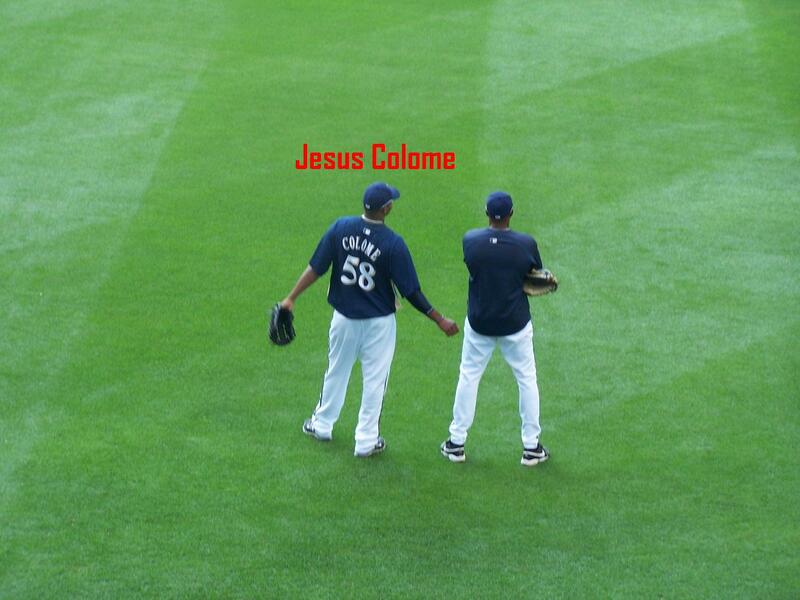 Much has changed since the 2003 season at Miller Park. Crowds are no longer 12,000 or 13,000…they’re upwards of 36,000 or 37,000. Many areas of the stadium that were once wide open have now succumbed to advertisement/corporate bullsheet. Further cluttering room to roam. 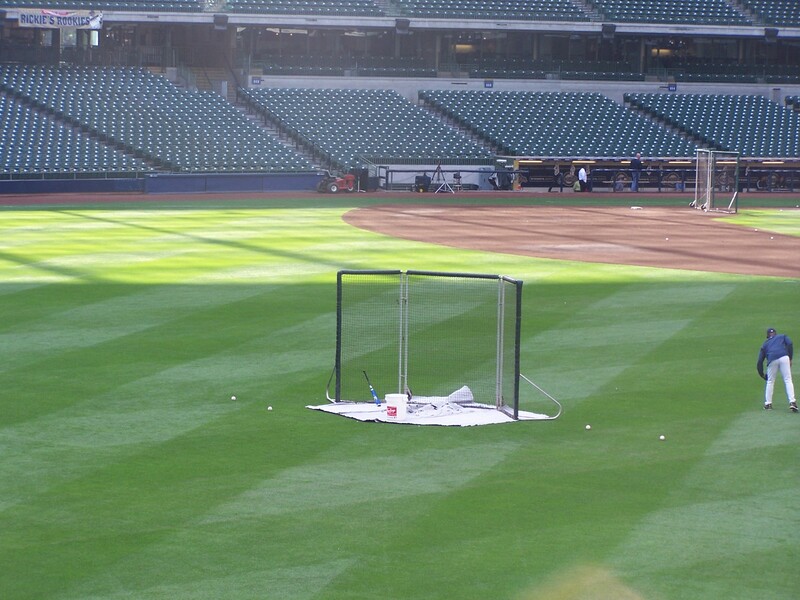 The Miller Park stadium staff have ironed out many of the wrinkles that existed in the stadium’s infancy. Steroids have been taken out of the game reducing long balls. The manual scoreboard “moat” is long gone (once a great glove-trick area) and has since been replaced by a party area. show what a daunting task I would face in topping that number someday. …but those two were both out of reach. …booyah. 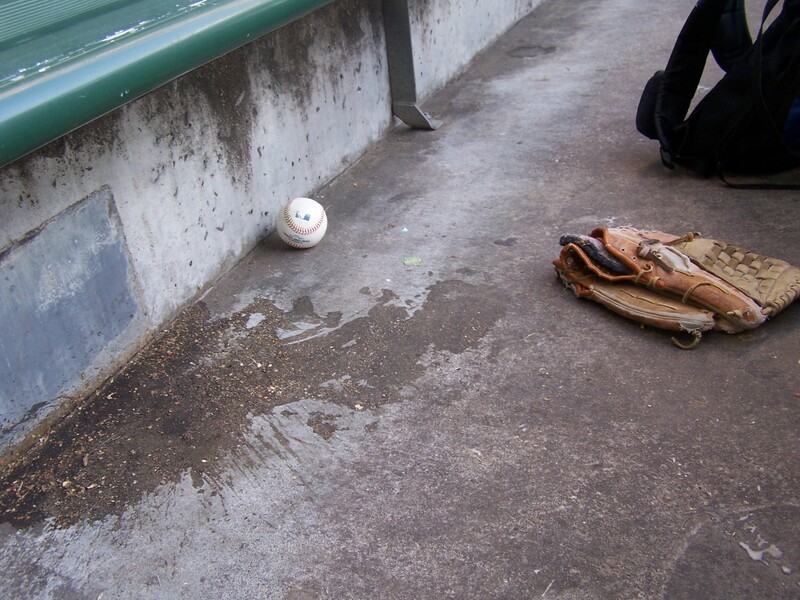 I quickly lowered the glove-trick over that baseball and began to reel it up. Unfortunately, it didn’t have a good hold and fell back into the bullpen. After a quick adjustment of the rubber band, I lowered it back over the ball and had a better hold. As I was reeling it back in, I took a quick glance to the field (because the Brewers are funny about this kinda stuff) and saw Brewers bench coach Willie Randolph staring at me as I was reeling it up. All I could do was to smile and shrug my shoulders. He shook his head and I continued to reel it up for my 1st of the day. Career ball #957. 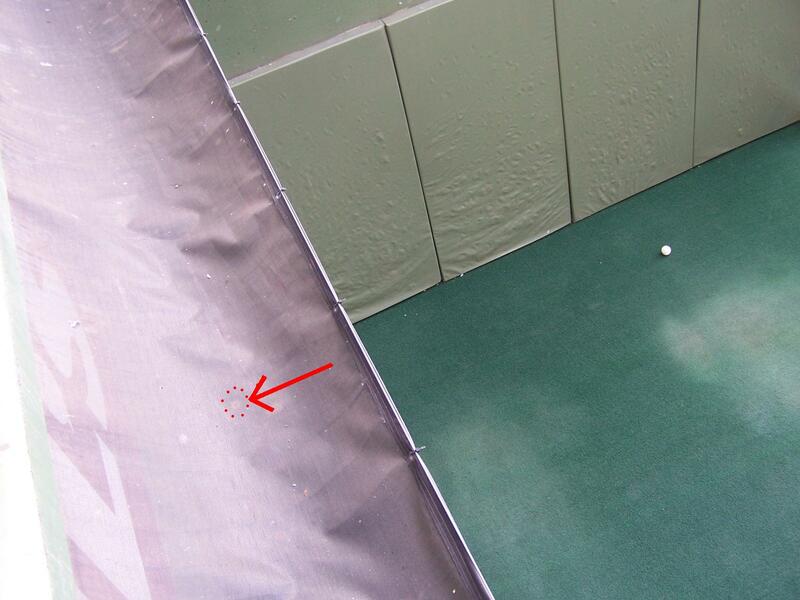 Do you see the ball (with the red drawn dots surrounding it) behind that protective netting? More on that ball later. 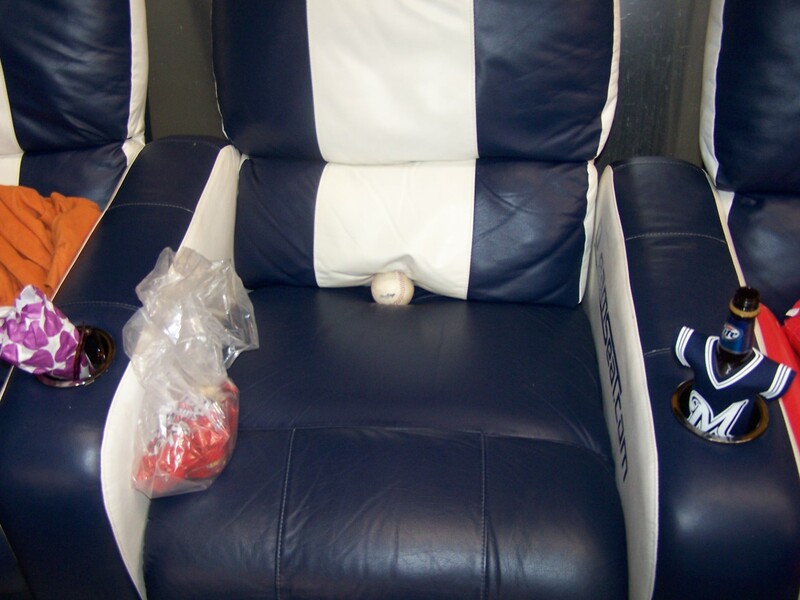 After getting a toss-up from Brewers reliever David Weathers, another Brewers player tried to toss one to a fan. Through a combination of uncoordination and poor aim, the ball fell into the protective netting that overhangs the bullpen. After watching a guy struggle to get it for awhile, I offered to try using the glove-trick. It works in that netting-you just have to utilize the weight of the glove a little more. After about 20 seconds, I had it. I then gave it to the couple who were freaking out about getting it in the first place. Back to the ball (behind the protective screen) pictured above. 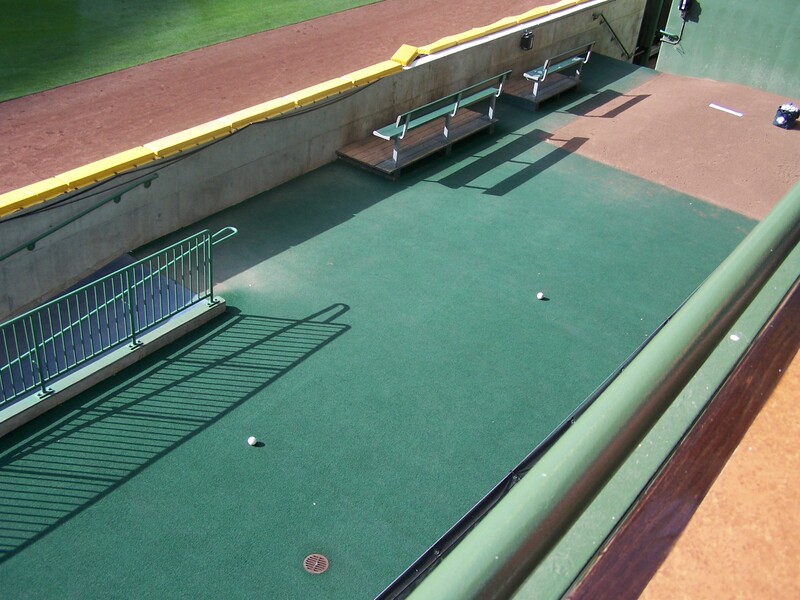 I noticed that one nestled up against the bullpen wall. After a few swings to knock it out of the corner, I reeled it up for #4 on the day. While I was positioning my glove for #4, another baseball landed in the bullpen. That ball was glove-tricked as well for #5. 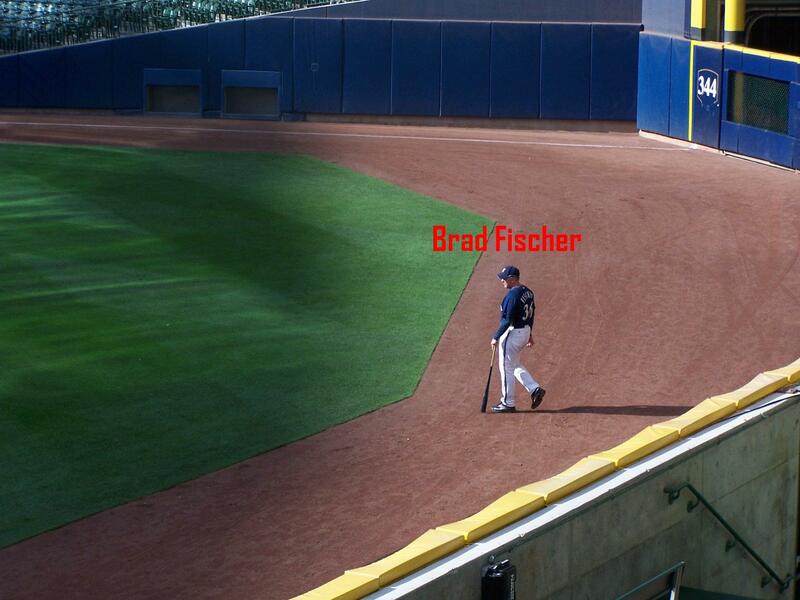 As he always does, Brewers 3B Coach Brad Fischer was using a fungo to hit baseballs back to the bucket out in left-center field. He responded with a laugh. Finally, I convinced him I would not keep the ball. The objective?? To get the ball in the bucket. …coming to a rest just to the right of the bucket. The toss (from about 125 feet) was perfectly elevated. It landed just to the right of that red arrow, one-hopped the net and almost came back down into the bucket a 2nd time. Damn, that was close. The people sitting in Friday’s loved it. Gotta have a little fun. I staged its retrieval via verbal agreement. I never intended to keep it. Whaddya think? Would you guys have counted it? Let me know. It won’t change my ruling one way or the other. 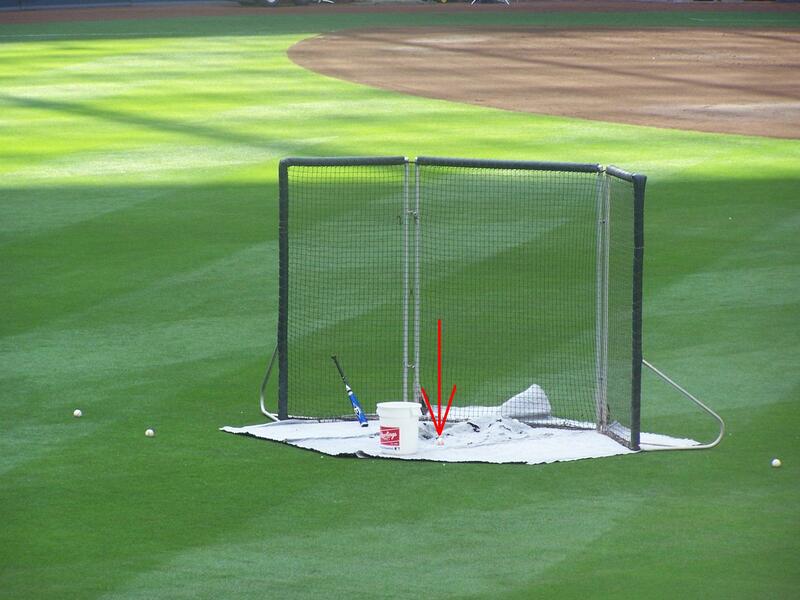 On a side note: do you see the little aluminum bat resting against the protective screen in the picture above? That was being used by the son of David Weathers earlier in the day. Apparently, he was taking a few hacks out on the field. Lucky kid. …after a friendly request in his native Spanish tongue. I would retrieve 2 more baseballs in the next 5 minutes off the bat of the “Hebrew Hammer”-Ryan Braun. One was snagged on the fly and the other was snagged on the bounce. I gave the one snagged on the fly away to another fan. Ball #9 soon followed…snagged on the fly off the bat of Felipe Lopez. Nine baseballs and the rest of the stadium hadn’t even opened yet! That’s the kind of start I would need if I wanted the record. When the clock struck 5:30 pm,, the gates to the stadium officially opened. I dashed up the staircase that leads to the 2nd level of bleachers (loge level). I scanned the rows for any easter eggs. Conveniently, there’s been a cleaning crew that comes through the bleachers to wipe off the benches right before gates open. Anytime there’s a baseball hit up there, it’s pocketed by one of the workers. The above picture was not staged. That’s exactly how that ball was found. I tossed my backpack and glove down and took the picture. Hell, I was so jacked, I didn’t even mind that the ball was lying next to a gigantic dried pile of some drunk college kid’s vomit. Double-digits and I still had almost an hour left to BP. Holy crap! The Pirates pitchers were now in left field making their warmup tosses. Three minutes after I changed into my Pirates gear, Pirates pitcher Matt Capps tossed me his warmup ball. The last Brewers group was in the cage. After missing out on a few of Casey McGehee’s bombs by a couple of steps, I was able to secure #12 off the bat of Mike Rivera. When it was hit, I knew it would land a few sections away. Immediately, I started sprinting through the seats to make up some ground. When I felt myself getting dangerously close, I slowed down a tad. BAM! It landed about 15 feet away from me and I quickly grabbed it on the bounce. The Brewers finished hitting so there was a lull in the action. I sprinted down the staircase back down to the field level and ran all the way over to right field to check out the visitor’s bullpen. There was one AND it was in position for the glove-trick. Just like that…Ball #13. By this time, I started to realize 17 was within reach. I can only imagine what it’s like for a big league pitcher with 6 perfect innings in the books. Around the 7th inning or so, he starts to really lock himself in. From a fan’s perspective, it felt similar. Eventually, I made it back to left field. There, Pirates pitcher Denny Bautista tossed me Ball #14. It certainly didn’t hurt that I asked for the ball in Spanish. 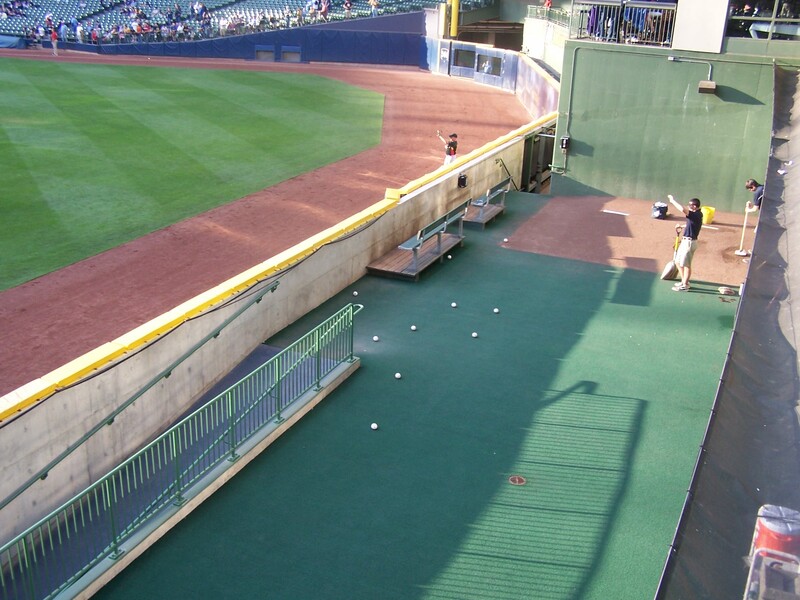 While I was standing in the left field loge bleachers, I noticed a ball that was glove-trickable in the Brewers bullpen. So, back down the stairs I went…sweatier than hell. After 10 seconds, Ball #15 was reeled in and I was officially locked in. I had just tied my single-game record of fifteen (15) and I had plenty of time to do some more damage. Unfortunately, my luck would change. The last 10-15 minutes of BP were a bit slow. A few of the Pirates lighter hitters were in the cage and I felt like I had used up my allotted number of tossups. There were no glove-trick opportunities and I was officially screwed. The Pirates hitters hit more balls into the Brewers bullpen than any two teams combined. When the Pirates starting pitcher, pitching coach and bullpen catcher began to walk out toward the visitor’s bullpen, I started to make my move out that way. 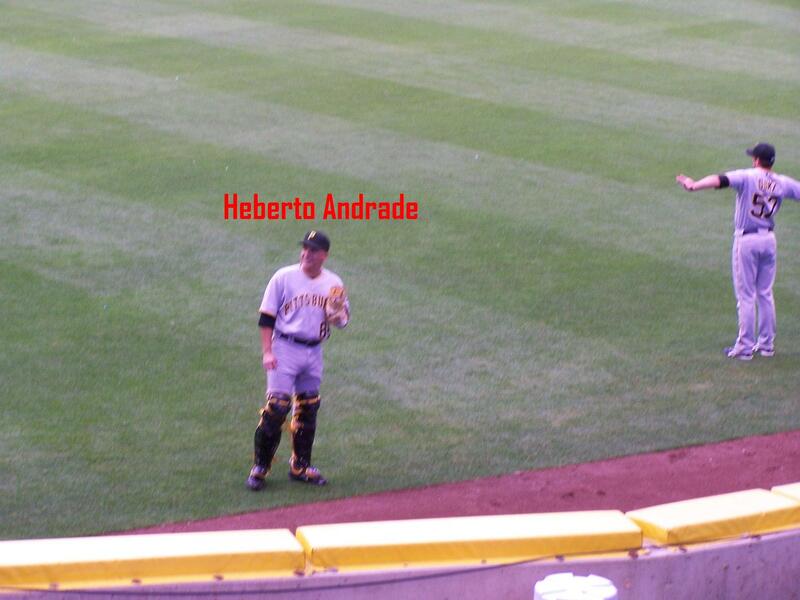 I was still about 20 feet away from the back of the visitor’s bullpen when Pirates Bullpen Catcher Heberto Andrade looked up toward me. He made a motion and tossed me a ball. WTF??!! I wasn’t even that close to him and the throw sailed about 7 feet to my right. Luckily, it bounced off a chair and stopped just in time for me to pick it up for #16 on the day. But, I needed one more to tie the Milwaukee record and two more to break it. I needed to get two more baseballs…somehow, someway. I knew I had a good chance for an ump ball after the game, but that would only tie the record. I had to figure out a way to get one before that. I decided I would try for a pre-game warmup ball by the Pirates dugout. Not many Pirates fans in attendance, it should be easy, right? Only 1 pair of Pirates came out to throw and Delwyn Young tossed it to a guy down to my right. Okay…no problem. I’ll just stay in the box seats until after the bottom of the 1st inning. Maybe I’ll get a 3rd out ball. Wrong again. What I ended up getting was a great view of Prince Fielder’s bomb into my section in the bottom of the 1st. No worries…I don’t know if I could have snagged it anyway. It landed in the top row of the Tundra Territory (now you know why I don’t usually roam around the stadium in search of meaningless baseballs…opportunities missed like those). Concerned about missing further opportunities, I headed to my seat out in right-center field. 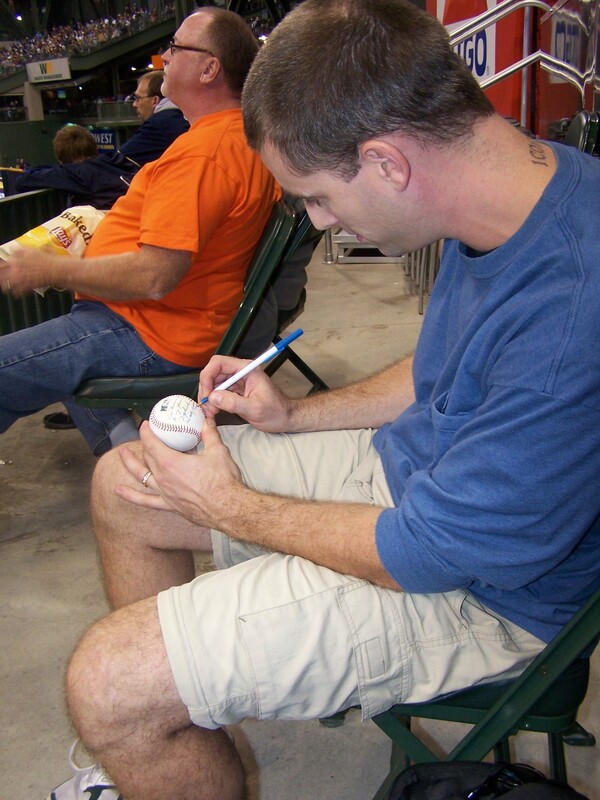 When I got there, I visited with the fan who ended up with Prince’s home run…#150 of his promising career. It was a lady in her early 40’s. She tells me she was standing in the top row of the Tundra Territory when it was hit. …right in the crease of the cushion! She told me she plucked it right out of there. I was wondering if I could continue MY good fortune when #17 came straight out of the blue. It was before the start of the top 1/2 of the 6th inning. Brewers CF Mike Cameron came running out to take his position. Like he always does, he warms up with LF Ryan Braun. As luck would have it, for a reason I’ll never know, “Cam” had brought a baseball out with him (the warmup ball is normally supplied by the ballboy/ballgirl down the LF line). He started jogging toward me with the ball in his hand before making his warmup tosses. I thought to myself, “is this too good to be true?” So, I stood up and flashed my glove. Sure, there were others around me, but I was the only one with a glove. Easy choice. Cameron fired it right to me. I had just tied the Milwaukee record. …I patiently sat through the remaining 4 innings. 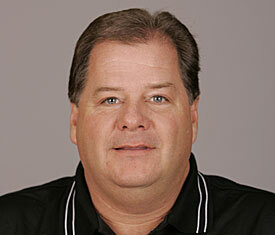 No more home run chances…I would have to rely on Home Plate Umpire Jerry Layne. So, in the top of the 9th inning, with the Brewers clinging to an 8-6 lead, I headed out on a mission to establish a new ballhawking record for the City of Milwaukee. I watched (from the 7th row) as Trevor Hoffman notched his 28th save on the season. When the last out was recorded, I darted down the steps and got into position. Mr. Layne would have to walk right past me to get into the umpire tunnel. I felt my chances were good. Jerry’s ball pouch had just been loaded up a pitch prior to the last out-I knew he had extras. Without hesitation, Jerry reached into his pouch and pulled one out. He then placed it right into my mitt for #18 on the day! 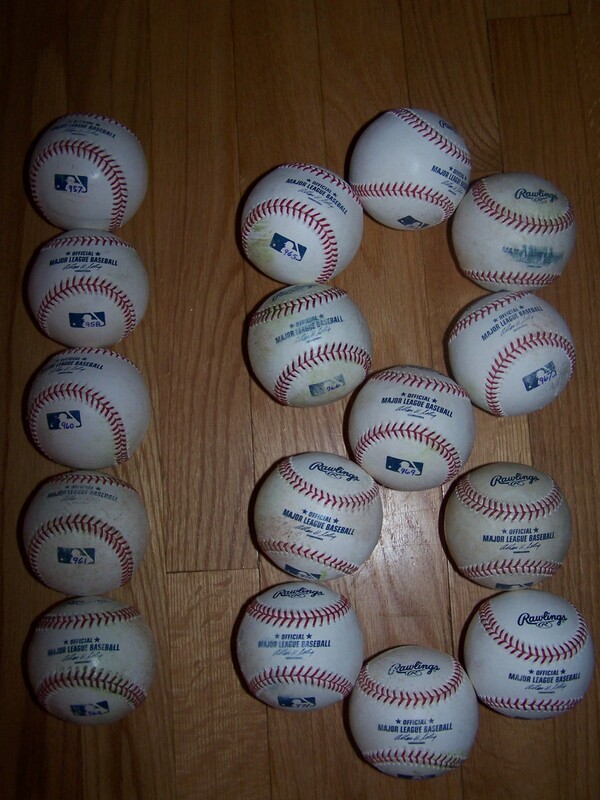 …with 16 of the 18 snagged shown (2 were given away). This just proves how good Zack Hample is at snagging. He established the record in his 1st trip to Miller Park. It took me over 200 games to get mine…but, it was well worth the wait.